Balanced and varied energy sources for sound growth and development. Contains high-fat rice bran pellet, Moore Natural™ Omega Glow. 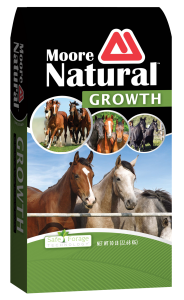 Formulated with Moore Safe Forage Technology™, a natural forage-based source of digestible fiber. Fortified with KER Micro-Max™ Micronutrients and essential amino acids for growing horses and broodmares. Constant formulation with the unvarying palatability horses desire. Fortified with organic trace minerals for unsurpassed digestibility and performance. Pelleted form, no sorting and wasting of ingredients. Wheat Middlings, Rice Bran, Ground Grass Meal, Suncured Alfalfa Hay, Ground Corn, Soybean Oil, Soybean Meal, Flaxseed, Heat Processed Soybeans, Soybean Hulls, Molasses, Calcium Carbonate, Salt, Monocalcium Phosphate, D-alpha Tocopheryl Acetate (source of natural Vitamin E), L-Lysine, Zinc Sulfate, Zinc Proteinate, Copper Proteinate, Manganese Proteinate, Manganese Sulfate, Copper Sulfate, Sodium Selenite, Folic Acid, Mineral Oil, D-Calcium Pantothenate, Choline Chloride, Riboflavin Supplement, Vitamin A Acetate, Vitamin B12 Supplement, Thiamine Momonitrate, D-Biotin, Niacin Supplement, Menadione Sodium Bisulfite Complex, Pyridoxine Hydrochloride, Calcium Iodate, Vitamin D3 Supplement.